There is no dish better suited to be topped with a fresh Pico De Gallo than a fajita taco. 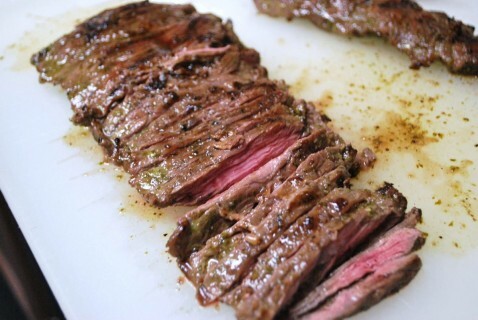 Fajita meat is made with a cut called skirt steak. It's typically a lower cost cut that is thin with a lot of connective tissue which makes it tough unless properly prepared and served. A skirt steak is big on flavor, and with some simple techniques it can be tender as well. It's all about the marinade, the rest, and the proper slice. There are two cuts of skirt steak - outside and inside. Inside is much more commonly found and is lower in cost. Outside skirt steak is the "real fajita" meat and costs more. I don't find it at our market very often. Rob Walsh wrote about this a couple of years ago. The Japanese pay a premium for it and our fine government charges them no tariff, so off our outside skirt steak goes. Juan Soto, owner of La Parranda, a local Tex-Mex place on Stuebner Airline has offered to sell me an outside cut. They are the only Tex-Mex place I know on the north side of Houston that uses outside skirt steak for their fajitas. Every time I get ready to take him up on that offer I just end up eating theirs because its wonderful. They make a great hand made corn tortilla too! Beef flavor should be the star in fajitas. I don't mind some spice, but I don't care for it when it tastes like an over seasoned montage of something else. I like beef. I simply salt and pepper the meat and squeeze a generous amount of lime over the skirt steak. Cover it or place it in an air tight bag and remove as much air as you can. Let this sit on the counter for at least an hour. The acid in the lime juice starts to break down the tough stuff. The beginning of tender tasty beef happiness. Some folks take off that thin membrane you see there in the picture. I say screw that, its bringing some flavor to party. Trim it later when its done IMO. I've never seen a Mexican grill any meat with out some green onions. Never. And its for good reason. Grilling green onion adds aroma that is hard to resist. Skirt steak is absolutely best cooked over mesquite charcoal or wood. The char and light smoke are the final flavors needed for a real fajita taco. On wonderfully hot coals sear each side for 5 - 6 minutes depending on just how hot you have this fire. Flip it just once. Skirt steak is a thin cut so I'm not necessarily looking for the medium rare pink center. Once you've grilled the skirt steak immediately wrap it tightly in aluminum foil. What is happening now is the meat will begin to slowly cool and rest. Resting is very important for all grilled beef. The high heat pushes the fat juices to the center compressing them. Resting allows the juices to redistribute throughout the cut making for a moist piece of beef. 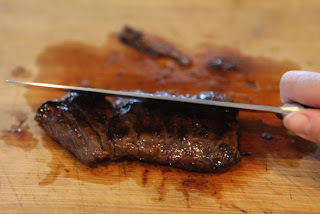 This grilled skirt steak can rest wrapped in foil for as long as 20 minutes and still be hot to the touch. While your skirt steak is relaxing, grill some onion and bell pepper to use with your fajita taco. Might as well char up a Serrano pepper for those looking for some heat. This next best thing you can do for tender pieces of skirt steak is to be sure to slice it across the grain. Skirt steak is long and skinny. It's tempting to just slice it cross ways from one end to the other, but that is actually with the grain and makes for tougher eating. Cut the skirt steak in to 2" - 3" sections and slice down what once was the long side. Now your cutting against the grain for a tender slice. Here is an image from The Tasty Kitchen blog where she has it right. I was too busy making tacos to snap a photo of mine. That and my fingers were dripping with beef juices and I didn't want to smeg my camera. Cutting across the grain makes a massive difference in a skirt steak. Really really important. Toast up some tortillas on a comal for your taco. Corn is my favorite, but you mostly find flour tortillas at the Tex-Mex joints. I have noticed that most taco trucks serve corn tortillas interestingly enough. For me its best topped with Pico De Gallo. Michelle likes some sour cream and cheese. What ever tips your taco. Again, no photo. By now I had pico de gallo stuck to my thumbs. Sorry. Making tacos sure is fun. Your father was a very handsome man. Oh yeah! Might have to try these for the 4th. Looks great! Enjoy the holiday weekend.